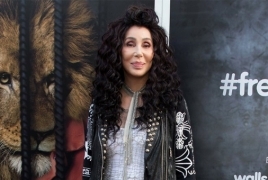 PanARMENIAN.Net - Cher announced on The Ellen DeGeneres Show on Friday, Sept. 7 that the Here We Go Again Tour in 2019 will mark her first trek across the U.S. in five years. The 72-year-old entertainer, who is currently doing a series of residencies in Las Vegas, will release Dancing Queen Sept. 28, E! Online says. "Didn't you have a farewell tour about 15 years ago?" Ellen DeGeneres asked. "Yeah," Cher said on Friday's episode. "And I thought it was! I mean, I was old. I was already old. I was thinking, 'How many more can you have?' It's like Al Pacino. They brought it back." DeGeneres then gave fans a chance to win a pair of tickets to her show by visiting her website.